It’s annoying when you miss a phone call, but it happens from time to time. The caller may leave a voicemail if the call was important enough, and sometimes they’ll even leave one even when it wasn’t. That said, no one wants the voicemail section on their phone to be cluttered with old messages. Luckily, you can save them either directly to your iPhone or your PC, thereby clearing up space and preserving precious messages for future reference. Depending on which carrier you have, this process can be done on your phone or using a third-party program. Either way, saving voicemails isn’t difficult, and with this guide, you’ll be saving your missed messages and organizing your voicemail inbox in no time. This will be the easiest method, so long as you’re using iOS 9 or later, and your smartphone carrier supports Visual Voicemail. Visual Voicemail is the list of voicemails you should see when you go to Phone > Voicemail. Carriers such as AT&T and Verizon support this feature, and it’s easy to set up. If you’re unsure if your carrier supports Visual Voicemail, your carrier’s support page or customer service department should be able to let you know. 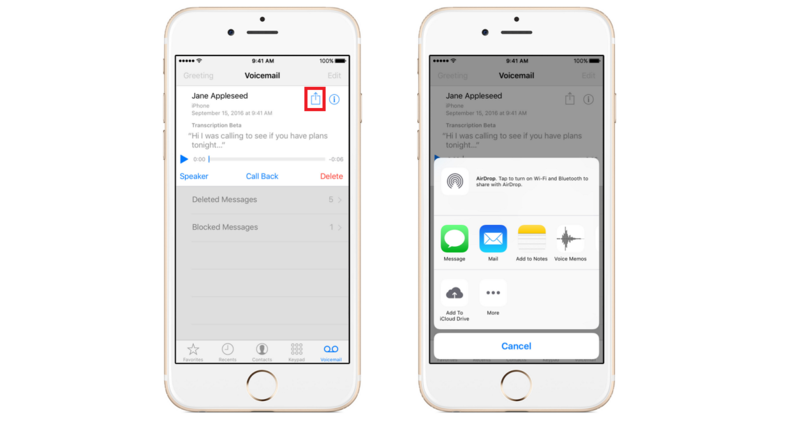 If you can use Visual Voicemail, then it’s easy to save your voicemails using your iPhone. Here’s how. Step 1: Launch the Phone app and select the Voicemail tab in the bottom-right corner. Step 2: Tap the voicemail you want to save, followed by the Share icon. The icon resembles a box with an arrow pointing out of it. Step 3: In the resulting pop-up window, choose a save location for the voicemail audio. You can either add it your Notes app, save it as a Voice Memo, or send it to a contact via Messages. You can also email the audio, or upload it to iCloud Drive. Step 4: For any messages you don’t need to save, simply tap Delete in the bottom-right corner. If you’re unable to use Visual Voicemail, or simply want another method, there’s always iExplorer. The program allows you to save many things from your iPhone, including text messages, your call history, and other media housed on your device. The program starts at $40, but you can download it for free and use it in demo mode if you don’t want to pony up the cash. First, you’ll need to install iTunes on your PC, as you need your phone to trust your machine before the two will interact. Consider making an a backup of your iPhone as well, since iExplorer uses the backup to find your content. The program will create its own backup if there’s isn’t one available, but that will take some time. Once you’ve installed iExplorer and made a backup, connect your iPhone using a Lightning cable. Launch iExplorer and your iPhone should appear on the left side of the application window. When it does, select your iPhone and click Data > Voicemail on the right-hand side. You can also select your iPhone, click the drop-down arrow next to it, and, under Backup, select Voicemail. Once done, your voicemails will load in the main program window and you’ll see the contacts, the date of the voicemail or call, and the duration of the voice message. To save voicemails, select them individually and click the Export button at the bottom. To save all voicemails at once, select Export All.